An Inspired Self Help Test For Stepping Up to Earth 2.0! Assist You To Reach Earth 2.0! On this inspired self help test page I reveal the existence of a New Earth, Earth 2.0. There’s a version of Earth which already exists in a parallel reality to that of this Earth. If your desire is to move into a parallel reality that's more in alignment with who you prefer to be - then read what's being said to find out if you’re allowing yourself to ramp up your vibrational frequency enough in order to move ever closer to Earth 2.0. By reading the bite-sized subjects on this inspired shortcuts page, perhaps you’ll be able to see whether you’ve opened up your heart and your mind enough to step into a new reflection of Earth. That is to say, read on to find out if you've stepped-up your vibrational frequency to a level that will allow you to experience Earth 2.0. Or if in fact you have more inner work to do in order to raise your vibrational frequency. 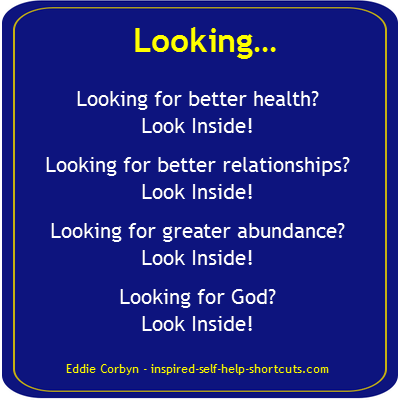 Take this informal inspired self help test to find out! This inspired self help test will assist you to gauge the level of your current understanding concerning the nature of existence, what’s important to you and what’s real. And upon clarifying these things for yourself you’ll be perfectly positioned to make more informed choices and to change direction, if you so desire. The questions and insights on this page are not designed in ways that demand a yes or no answer. There are no answers that are empirically right or wrong so there are no real mistakes, there are only varying degrees of your awareness of your own consciousness and that level of awareness is controlled by you. I want to reemphasize and clarify that while our experience of reality changes the reality itself never changes, because there's "no time" in which change of any kind can occur. The only thing that actually changes is the focus of our consciousness as we shift from one perspective of a fixed and unchanging viewpoint of one parallel reality to another perspective of a different parallel reality, thousands of times per second, over and over again. To really grasp this idea consider the analogy of viewing the individual frames in a single strip of film from a distance. From the perspective of seeing all the frames at once you can see that each frame is a discrete, stand alone, unmoving and unchanging picture. However, you know that when these individual frames are passed through a projector of light in quick succession you see the illusion of movement. All realities exist simultaneously here and now! There is another version of Earth which I call Earth 2.0. To understand that this is so, one must look into and fully comprehend the idea that existence itself is comprised of infinite parallel realities. And further, to know that there is not and never has been only one fixed or primary reality that we can gauge by and say: yes this reality is real so that other reality is not really real, all parallel versions of reality are as real (or unreal) as each other. Furthermore, it's imperative to really "get it" that all of these parallel realities exist simultaneously right HERE within the one eternal moment of NOW, simply because there is no other "time" or "place" in which they can exist! They exist right here and right now at varying vibrational frequency levels that are out of range of where we’re currently vibrating, so they're invisible to us. Therefore, it becomes obvious that as your consciousness raises its vibrational frequency to higher levels, realities that were heretofore hidden are now revealed. So the only reason we’re not already experiencing Earth 2.0 has to do with our individual vibrational frequency. We can only perceive and experience those realities that we match through vibrational frequency. Perception of reality is akin to discrete radio or television channels - all channels exist now but you can only see the one that you’re tuned into in any moment. And just because you're not tuned into any particular channel doesn't deny its existence. As a being currently experiencing a linear life in a 4D reality, perceiving multiple realities simultaneously would obviously not serve us, as we didn't sign up for such a multidimensional game at this timing. Nevertheless, the only reason why we’re not seeing and experiencing multiple versions of reality all occurring simultaneously is because we’re vibrating at a different frequency to those realities. So they remain invisible to us even though they’re always right there in front of us! Within the one eternal moment of Now there’s no time in which anything new can be created, thus creation is and always has been complete. That is to say, there's no beginning and no ending to creation. While we’ve been led to believe that there’s an actual process called linear time, in truth "time" is an illusion. That is to say, linear time is an artificial construct that’s maintained as real by our rational 4D mind, simply by our continued belief in it. The process of movement, growth and continuity through space occurs within our rational mind, but not outside of it. Therefore, outside of this Mind Matrix (to use a word) reality creation is already finished. Thus, if something can be imagined by us then it logically follows that it already exists within the idea of Now and therefore it can be experienced by us providing that our belief in it is strong enough. 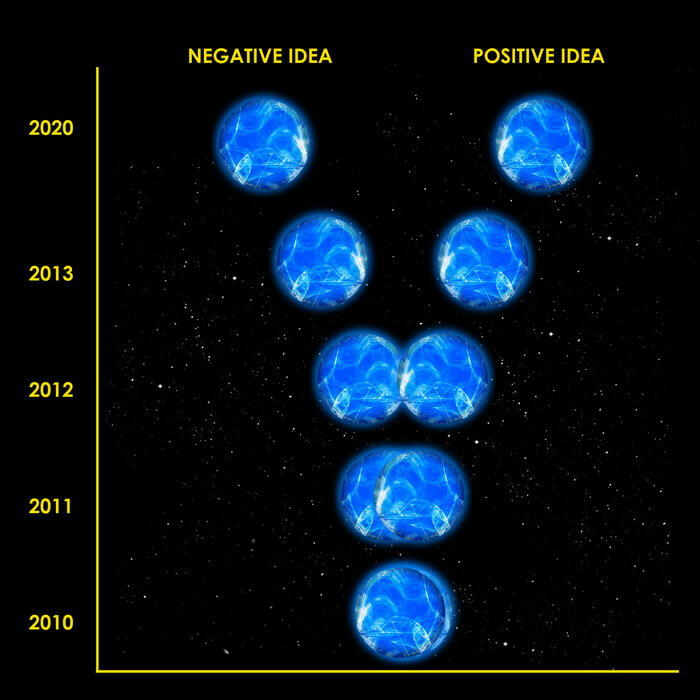 Changing our belief causes change in vibrational frequency and that means we can perceive and experience a different parallel reality, such as Earth 2.0. So creation is already complete and this implies thus then, that anything that can be imagined can be experienced. This is because any reality imagined already exists within the idea of All That Is - which is existence Itself. Further, this also means thus then, that anything that cannot be imagined cannot be experienced because it lies outside of the realm of existence, within the idea of the realm of non-existence. Earth 2.0 is a reality comprised of positive self-empowering ideas. There are no national borders and thus no wars. Religion shares a common belief in One God or All That Is who is not separate from who we are. Non-polluting free energy technology powers that planet. Hunger, homelessness, poverty and dis-ease cannot exist in a world populated by brothers and sisters sharing love. Furthermore, that particular version of Earth, Earth 2.0 is populated by people who're fully consciously aware, people who’ve awoken from their dream-like state and who know that reality is akin to a dream. The main difference between the inhabitants of Earth 2.0 and people like us who're in the process of awakening, is that those people know they’re dreaming while we haven't yet remembered and so don't know that we're dreaming! As you can see, to really, mentally, grasp this understanding and to know without a doubt that Earth 2.0 exists you’ll need to join a few dots. Remember that due to linear time being an illusion creation is already finished. And because there’s only the one eternal moment of NOW, therefore all possible realities already exist as potential for you to experience NOW. Plus, any reality that can be imagined by you exists so that’s also how to know that Earth 2.0 exists. However, in order to bring Earth 2.0 into your conscious awareness and to experience it as your reality you have to imagine it as your preferred reality. And then your non-physical higher self (which has a greater view) downloads a clearer idea of it to you through the channel of imagination. Thus, your (future) personal reality is really conceived by your higher self. Remember that you won't actually be able to experience Earth 2.0 unless you're a vibrational match. Tuning in to a positive or a negative idea of reality by matching its vibrational frequency makes it visible to you! So by now perhaps you can see that within the idea of All That Is multiple versions of Earth are available for us to experience. Further, each of these versions of Earth exists as infinitely varying degrees of positive and negative ideas. Furthermore, our idea of each and any of these versions of Earth is only limited by our own imagination. Therefore, considering that any and all ideas of any future reality experience of any version of Earth begins in our mind through our own imagination, why not choose to imagine Earth 2.0? All we have to do is decide and imagine, to the best of our ability, the kind of world we’d prefer to experience. That's what I'm choosing. For instance: through my experience of living on this current version of Earth, a world consisting of dualistic and contrasting positive and negative ideas and extremes of good and bad, right and wrong, have and have not etcetera. I now choose to live and experience the more balanced and harmonious idea of Earth 2.0 and thus I’m working my way towards it through my imagination and love of it and my belief in it. To experience any imagined reality a firm belief in the possibility that you can and will experience that reality is necessary. If you choose to believe that the reality you’re currently experiencing is the only reality available to you, then the nature of belief is to perpetuate your idea and sustain it as your experience. First realize, thus then, that infinite possible realities are available for you to experience and that due to your current awareness, beliefs and vibration you’re only limited to experiencing infinite probable realities. Therefore, getting clear about any reality you prefer and believing in it is the catalyst that will begin to shift you towards it. Anyone vibrating at the negative frequency of fear won't reach Earth 2.0. Power hungry, domineering, destructive, grid-minded, greedy people who’re dominated by egotistical and self-serving thinking won't reach Earth 2.0. Due to their lower vibrational frequency these kinds of people cannot see Earth 2.0, thus they will not experience it. There's no judgment in that, it’s all about polarity, vibration and what those beings want to experience for their own growth, from the level of their soul. Don't fall into the trap of blaming these people, lest you lower your vibe. As we move past the idea of 2012 and the years that follow, these kinds of people will fade out of our awareness. You came into this reality in order to experience the transformational age. Well, here you are and this is it! From your non-physical perspective you set an intention to move from the experience of a negatively focused version of Earth into an experience of a positively focused version of Earth, Earth 2.0, within this lifetime. Are You Really Ready For Earth 2.0? If you insist on holding on to old ideas and old beliefs that you know do not serve you, then you haven’t changed. If you insist on watching fear-based television news and other controlled negative main stream media, then you haven't changed. If you insist on sharing time with those people who’re wallowing in self-pity and self-imposed pain, then you haven't changed. If you insist on supporting those who continue to destroy the Earth, even though you say that’s not what you want, then you haven’t changed. If you insist on blaming those who continue to destroy the Earth, thereby placing your power outside of you, then you haven't changed. To make the invisible visible in your experience you must be in harmony and balance in all areas of your life. If you’re not in harmony and balance then you’re not a vibrational match to the reality that you say you want to experience. That is to say, because you're out of vibrational alignment with that reality, then that reality will remain invisible to you. To get into alignment with your preferred reality and in order for that reality to become manifest for you, you need to let go of all of the ideas, people, things and action which doesn't fit with your idea of your ideal reality. Thus, if you work for a corporation that you know is purposely destroying the Earth for profit, then you may want to reconsider that. Realize that your current friends and birth family might not be destined for Earth 2.0; their soul may have other plans for them. You’ll know in your heart if this seems true. If so, in your own time, simply bless them and allow them to go in the direction they're going and move on towards your destiny without them. As you shuffle, review and discard all that no longer serves you, you’re allowing the new to fill that void. And what of all of the new friends who enter your experience and who share many of your views and your visions - are they not your true brothers and sisters? Are they not your real family? 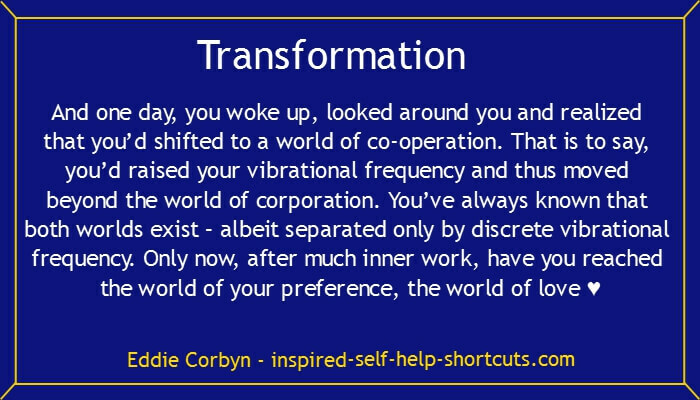 And as you consciously and deliberately co-create 'win win win' ideas, cooperative relationships, jobs and scenarios with the new people in your life, within the idea of your experience of life on Earth, are you not laying the foundations for that which you desire to experience with love upon the New Earth, upon Earth 2.0? Cooperation or Corporation - you choose! Inspired Self Help Test on How Long Will it Take? Once you’ve fully grasped and understood what’s being said on this inspired website, then you will not ask this question. Because you’ll understand that the idea of the movement of time is created within your own consciousness. Thus, in a sense, it’s already happened, is happening, you’re already living on Earth 2.0. When corporations are replaced with cooperation you’ll know you’re on Earth 2.0! However, from this particular point of view of the greater being that you are, you came here because you wanted to experience the process of moving through space-time from the idea of a negatively focused Earth to the idea of a positively focused Earth. While at the same time you wanted to wait for and be of assistance to as many others, the stragglers so to speak, in order that they can also make that transition with you. Therefore, relax and enjoy the perfect unfolding of this journey of your own creation. This inspired page is really an outline pointing towards the direction in which I’m heading, relatively speaking, it’s my truth. If any of my dreams and my visions resonate with you, please feel free to use them or adapt them to align with your idea of the kind of preferred reality you’d like to experience, and make that your truth. Have a Question about Earth 2.0? Please submit questions concerning the idea of Earth 2.0 on this self help test page. Thank you. Questions published on this page will be answered directly on this page. Think of it as a mini Q & A page. If questions are too short or unclear, I'll reword them to make them easier for everyone to understand. Please Enter The Title Of Your Question Here! Do you have some pictures or graphics that will add clarity to your insight? Great! Click the button and find the first one on your computer. Select it and click on the button to choose it. Important Note: The maximum image size accepted is 800x600. You will need to resize any photo larger than 800x600 pixels using your graphics software or a Web-based resizer, such as Picnik. Click here to see the rest of the form and complete entering text for your contribution. A Self Help Test2 Question on Installing New beliefs!